Act Your Age, Not Your Shoe Size (289/365 year 3) – Annoyingly Boring? …Wait, that won’t apply here. My 10 year old with his size 11 basketball shoes. A 10 1/2 would have been a better fit right now, but the time basketball season ends in March he probably would have been busting out of them like he did with last year’s basketball shoes. thanks. 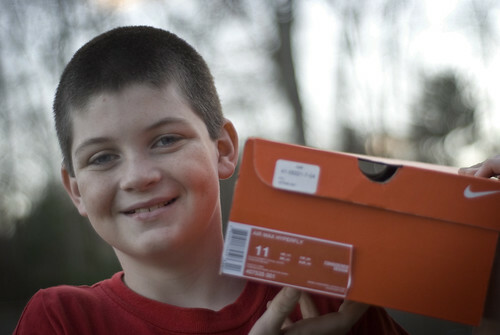 although in hindsight i would have given it a bit more DOF so both Aiden and the 11 on the box were in focus. the 11 is a bit soft. Holy Crap! Is he wearing skis as basketball shoes??? How tall is the young man, and how tall is he projected to get?